"Updating the popular N800, Nokia has made significant improvements on its predecessor with the N810 Internet Tablet while retaining much of what made the N800 such an easy-to-use mobile multimedia/communications device. 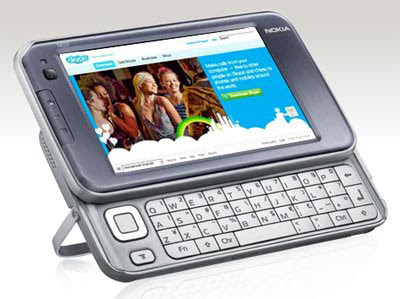 The N810 augments the onscreen keyboard with a backlit, slide-out QWERTY keyboard, and it also adds a front-facing webcam, 2 GB of internal storage (expandable via memory cards up to 8 GB), and integrated GPS. Built to be constantly in use, you'll easily stay in touch with business associates, friends, and family thanks to its VoIP calling, instant messaging and email connectivity. And with stereo audio, multimedia support and a new ergonomic design, the Nokia N800 morphs into a portable Internet entertainment device, enabling playback of streamed and downloaded content wherever you roam."